The FCC launched an official app to Android this week – a Speed Test app that will help the government agency produce an accurate map of mobile broadband performance. What users get out of using the app is a good sense of how well their phone provider’s network is performing. Think your data speeds are a little below average while at home or work? This app will help you find out, and then give you insight into the meanings behind the numbers. Not only are you able to test network speeds, but interestingly enough, the FCC is looking to help you make sure that you don’t go over your monthly data limits. You can set limits on your data, as well as set a date to reset your data limits to make sure you are on top of your data cycle. There is a big list of features, so take a look below. 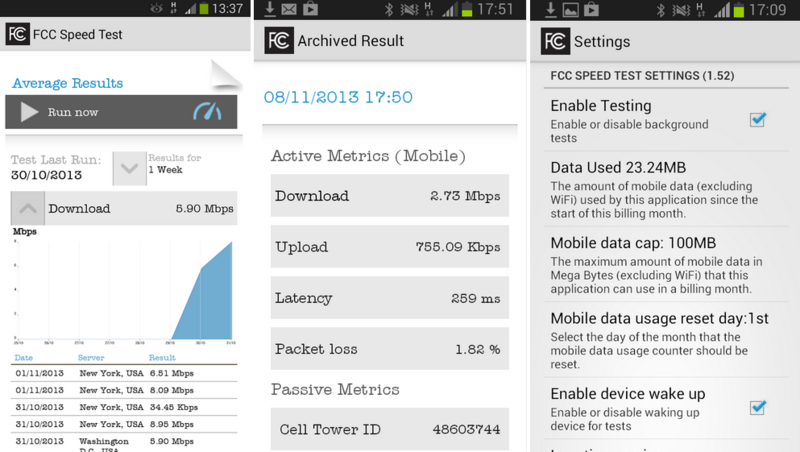 Access real-time performance data on your device. Historical results available at the touch of a screen. Help the FCC’s Measuring Broadband America program in developing the first open and transparent information on mobile broadband performance in the United States. Tests run automatically, you don’t even have to think about it. Run manual tests on Download Speed, Upload Speed, Latency and Packet Loss. Additional passive metrics collected such as Cell ID, Signal Strength and GPS location. By default, testing is limited to 100 MB per month–always consider your broadband usage carefully on limited data allowance plans. Raise your data cap to see more performance data. Lower your data cap and set a date to reset data caps so you don’t go over the limit on your plan. Want to be a patriot and help the FCC? Go grab it from Google Play for free and check it out.